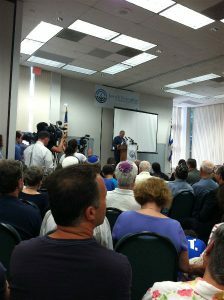 This morning I stood up for Israel along with hundreds of others at MetroWest’s rally to support Israel. While news reports have been overwhelming, this was a chance to come together as a community, as Klal Yisrael, and express our love and support. As we know, what is so challenging with the enemy is they do not value life. While the media reports rising Palestinian civilian casualties, we are grateful for the Iron Dome, and the support of the US. Aharoni emphasized that this is perhaps the most transparent military operation of the IDF. While “America goes the extra mile, Israel is going the extra 10 miles.” Israel calls individual households to warm the people of bombings. This is why it is taking longer to destroy the tunnels. Israel is acting in the most surgical fashion possible. Rather than using Israel’s materials to build something positive, Hamas has spent the past several years building rockets and tunnels with the purpose of inflicting death and damage on Israel. Other political speakers included Congressman Leonard Lance, Senator Robert Menendez and State Senator Tom Kean, Jr. A statement from Senator Cory Booker was read as well. Sen. Menendez said it’s time to ask where President Abbas is as he must choose between a marriage with a terrorist organization or Israel and a two-state solution. The crowd responded enthusiastically to all of the speakers, rising from their seats many times for the Senator. It’s important that we continue to speak strongly and clearly about the truth. Israel did not want this war. Israel uses its weapons/Iron Dome to protect its people while Hamas uses its civilians to protect its weapons.